Several days ago I installed an open source survey program on my web server, and fairly hastily set up a seven-question poll for teacher-users of Class Blogmeister. Over the next week or so, just over 50 teachers completed the survey. The results are reported below. It is important to note that this was not a scientific study, and I am making no attempts to calculate any statistical likelihood of larger trends or behaviors. It’s been so long since I took a statistics course that I do not believe that I could if I wanted to. This report only seeks to describe how 50+ teachers answered the questions. The data was desegregated by grade level, but there were so few respondents of K-2 and 9-12 classes, that I combined them to report on grades K-5 educators and grades 6-12. Here I am only looking for vague impressions about student motivation when they are blogging. The question could have been much better worded. It’s worth noting that the two groups are pretty closely tied together, possibly indicating that more could have been learned from a better engineered question. These next questions are better, since I ask whether the teacher has actually seen evidence that students are learning better. Most often, today, we actually want to see that evidence in test scores. But I want to trust teachers to say, yes, I believe that my students are learning better, and I’ve seen clues that make me believe that. Again, the differences between the elementary and secondary respondents is not great. However, it is interesting to see that educators of younger children more often indicated that they Strongly Agreed with the statement. This question also seeks to determine if blogging is motivating to students writing, especially if they are writing within the context of some academic subject. 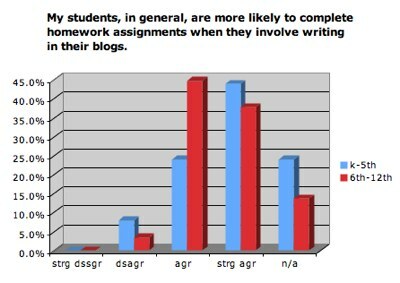 What would be even more interesting might be to find out what qualities of blogging make students/people want to do it. 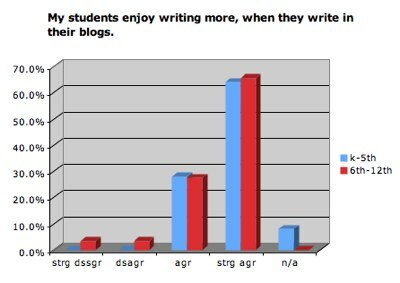 Again, indications from the 50 respondents is that blogging is motivating, perhaps more so for elementary than secondary, but not significantly so, considering the small sampling. Now we’re getting to the crux of the situation. 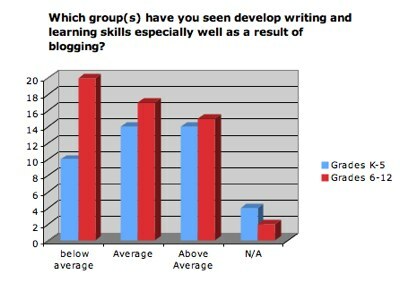 Do students become better writers when they blog. I believe that I have. But do teachers believe that their students have — at least these 50 teachers. 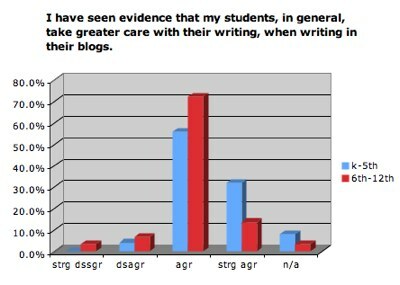 Here the trend reverses, as secondary teachers are more likely to see evidence of writing improvement in their blogging students than elementary teachers. There are certainly lots of possible reasons that have more to do with who responded to this poll than the writing experiences of blogging students. Most directly, blogging is about literacy, writing and reading and writing. However, how much of what I’m coming to call learning literacy is going on. Are students actually learning what they write about better, than when they are simply being taught it. I suspect that there is little to be gained here except that teachers believe that their students are learning when they blog. This is one of the questions I was most interested in learning about. 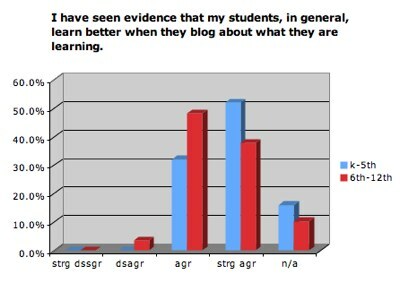 Who benefits the most from blogging in the classrooms. 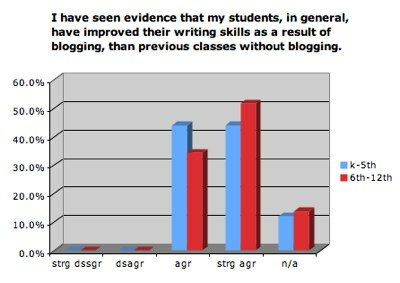 Once again, the sampling is too small and the conditions to chaotic to draw any real conclusions, but the secondary teachers who responded to this survey felt more strongly that lower achieving students gained more from blogging than did the average and above average performing students — this more so than elementary teachers. Finally, a fairly broad question that might be carried much more deeply in some future survey. 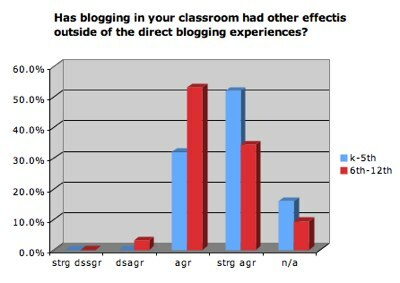 Teachers seemed to all agree that there were side affect outcomes to classroom blogging, influences not directly attributed to the blogging experience. My friend, Kevin Jarrett commented on yesterday’s blog posting about Lenovo’s “Yoga” computer, by describing Microsoft’s under-development Surface interface. I did a quick search on YouTube and found this very appealing video that claims to disput Microsoft’s invention of this technology. That aside, it’s fun to watch! The sound of children giggling — what can you say! Questions from the Department of Eduation ??? 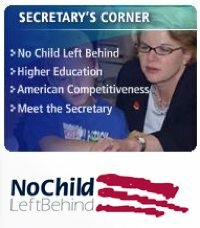 Our (U.S.A.) Secretary of Education has posted four questions for citizens to answer from their perspectives as administrators, parents, teachers, students, entrepreneurs, or business leaders. I’ve heard about the questionnaire on several occasions, but only when Steve Hargadon announced yesterday that he was posting them on the Classroom 2.0 Network for our consideration and conversation that I finally took a look. He’s posted four forum threads, one for each of the questions. The DoEd also has the questions posted on their web site, and a web form for use to submit our answers (limited to 1000 characters) for their consideration. As is my nature, and in my continuing efforts to keep this blog pumping, I’m posting my <1000 character answers here. In the schools I see as a parent, I would say that technology has not improved their effectiveness. My children have gone to good schools with good teachers, and they have learned their subjects well. They have been educated based in 19th and 20th century standards. They can read well, calculate well, memorize well, and write passably well. What is missing from their education is a sense of context. They know history, health, and science but they do not understand them. They know how to pass tests, but they are not so good at solving real problems. Appropriate uses of technology could help by making them exposers, explorers, experimenters, and discoverers. The analytical problem solving skills they have learned happened on their own time, through interactions with each other and through bedroom technologies, mostly video games. I fear that in most schools this question is unanswerable — because we have not come nearly far enough to draw any meaningful conclusions. Today, data is used primarily to compare schools, not to compare what our students have learned to what we’d hoped they had learned. When I taught, I gave tests and adapted my teaching to what I learned from those tests. I do not see much evidence of technology being used to these ends in the schools I come in contact with as a parent. Again, a long way to go yet before we can answer this question in any meaningful way. I think that global “cooperativeness” should be our goal. But that aside, I think that technology empowers teachers and learners. It provides a real window on the world that we are teaching our children about, and appropriately used, it gives them first hand access to that world where they learn by becoming explorers and experimenters, problem solvers and communicators. Learning is personal, and the windows that connect learners with what they wish or are required to learn, must also be personal. It seems that challenged learners, who are empowered with personal access to the world, will want to learn. Challenged learners who are disempowered by seat time, taught to, programmed, and scripted delivery, will not want to succeed. The federal government should invest heavily in research, to figure out what it is that children learn better with a computer, connected to the Internet, researching, collaborating, analyzing and manipulating, experimenting and exploring, and producing knowledge — and what is it that they learn better sitting in a classroom led by a teacher. We should restructure the school day appropriately to those findings. The federal government must also assure that every student achieve literacy skills relevant to today’s information landscape, that reading, writing, and arithmetic are ONLY foundations to that literacy, not the sole definition of it. The federal government must also assure that every learner have personal and convenient access to today’s information landscape, meaning that every learner have a computer and broadband access to the Internet. This is a national problem! Author David WarlickPosted on May 30, 2007 Categories education18 Comments on Questions from the Department of Eduation ??? I’m not sure my big old truck driver fingers would be happy with the keyboard, but this is a sign of things to come! — I think! With subnotebooks looking like a hot sector again, Lenovo’s Reserve Edition ultra-portable comes just at the right moment. Physically, it resembles the Intel Metro we’ve slobbered over, but replaces the possibly-pointless SideShow e-ink exterior display with the sexiest mouse and keyboard this side of science fiction. Like the competition, however, it’s extremely thin, bound in leather, and will be very expensive for what you get, performance-wise. Now just think about this for a minute. What does a desk look like… What does a classroom look like… What does a teacher look like… when something this small and foldable becomes a window on the world — and a conduit for reaching into that world? There is so much weight involved in traditional teaching and learning? This thing is a square peg in a round hole. Does Podcasting Enhance Oral Literacies? I met Jane Nicholls while working in Dunedin, New Zealand a few months ago, and was so impressed with the enthusiasm of teachers there. The job seemed to be “fun” for them. Jane is currently researching the benefits of podcasting and has asked me to forward a request for participation in her research project. In what ways does podcasting enhance oral literacies? I have been gathering data in my own context but I would love to hear what other teachers have found when using podcasting in their classroom programme and add voices from further a field into my final write up. I hope that you can help her with this very important question. 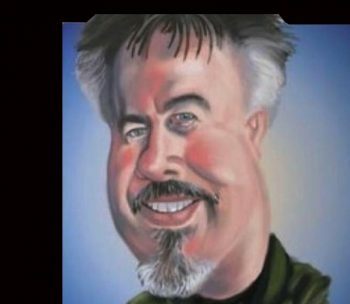 Author David WarlickPosted on May 29, 2007 May 29, 2007 Categories education5 Comments on Does Podcasting Enhance Oral Literacies? 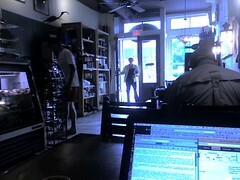 I’m in one of my favorite places, an independently owned coffee shop. Brenda and I stopped and stayed at the Davidson Village Inn, in lovely Davidson, North Carolina. It’s my kind of college town, and my kind of coffee shop. Yesterday, we’d just enjoyed an old fashioned country church picnic in my home town. For those of you, for whom this old tradition is foreign, please indulge. Every family brings their best home cooking, lays it out on plywood tables along with gallons of sweet iced tea. You walk around the tables, both sides, and fill your plate. then you find a nice shady place under a tree to sit, gorge, and reminisce about past church picnics. There were five different kinds of deviled eggs, and I sampled all of them. In addition — two varieties of meat loaf, a potato casserole, green bean casserole, pig in a blanket, two kinds of chocholate cake, and to balance things, a small plate of banana pudding. Needless to say, we didn’t feel like driving all the way home to Raleigh. So here, on Monday morning, sitting in the local coffee shop, sipping on the community’s free WiFi, is a blog entry I’ve been working on for several days. I make no promises that it’s quality will reflect that many hours of work! Dan, an educator associated with one of the New York BOCES, wrote an important comment on one of my recent 2Â¢ Worth blog postings, One Obvious Miss. He expressed some logical concerns about recent discussions on new literacies, what I called learning literacies. The vision of these new literacies that he seemed to be coming from were similar to that of many educators, one that is bound to the effective use of emerging technologies. The truth is that this is exactly the notion that I’m trying to get away from. Here’s what Dan says, and I am inserting my comments, unindented. I worry a bit about the notion of new learning literacy. It seems that whenever I turn around, there is a new tool developed that everyone is trying to â€œfigure outâ€ and apply to learning tasks. Each tool seems to morph and change in an eyeblink. Technology is constantly morphing. But the skills that I am thinking of are far more fundamental and tied not to any specific longstanding or fleeting application of technology, but to the changing nature of information that has resulted from this technology revolution. In a published print information landscape, the fundamental skills were the ability to read the text in front of you, process numbers and concepts logically, and write a coherent paragraph — the three Rs. Now that information is increasingly networked, digital, and overwhelming, the three Rs have expanded. It’s not just can you read? — but can you expose the text’s context? It’s not just can you do arithmetic? — but can you employ information? And merely being able to write on paper is not nearly enough. Can you express ideas compellingly using not only text, but images, sound, animation, and video? These skills result in the ability to use the information around you to accomplish goals, regardless of the technology. It’s about the information! Learning skills involve the ability to access information and answers, process them in a value-adding fashion, and express what you know and have learned to others — within any contemporary information landscape (and today that information is networked, digital, and overwhelming). Applying a blogâ€¦ a wiki.. or a tool being mashed together as we exchange this writing? – is knowing how to do this â€œliteracyâ€ if the tools will disappear? Knowing how to do it — is not literacy! 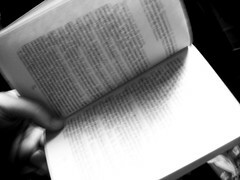 Knowing how to learn to do it — is literacy! I saw the K-12 Online Conference RFP and the term â€œperpetual betaâ€ jumped out at me. I had seen it a few days before too. I have used at least 4 podcast/audio creation sites this past year. All were labeled as â€œbetaâ€ and all went away. I loved two of them. I like the tool sites I see like bubbl and picnik. I understand the group processes and tagging, the power of the Web2.0. I feel your pain, as do most of us (over 50). It’s the nature of today’s information environment that it is not merely a place to consume, but also a landscape so rich and accessible that any of us can also become producers and even architects of the environment, inventing, building, and improving in a vicious and exhilarating cycle. Sometimes I am excited and sometimes I think we are creating chaos out of order! Get use to it. It’s all the more reason why we need to factor it all down to fundamental skills — can you use today’s information environment to help yourself learn what you need to know, to do what you need to do? Much of this is live blogged. Please forgive mispellings and awekward writing. Michigan now requires all students to take at least one online course to graduate. The speaker says that North Carolina is not far behind this. They just opened up an online AP Exams course, and in the first week they had 8,000 enrollments. The NCVPS promises not to establish enrollment caps. If students want they course or more seats (virtually), then they will find the teachers. The presenter also said that they have redefined seat time. He didn’t explain what he meant by that, but it is promising. They’ve recruited 350+ teachers, but need many more. They are providing professional development for virtual teachers. Seems to me like a whole new job/career as online teacher. I have to talk to my daughter about this. One common question has been asked — how do you assure security in online courses. How can you be sure that the student actually is the one who took the test… The presenter says that any course for which an EOC test is requred at the end, a School must administer the test face-to-face. For all other courses, portfolio assessment will be used. I know now. The presenter is David Edwards, Chief Marketing Officer, former director of technology for Lenoir County Schools. That’s where I know him. One of the more contentious issues that has risen from the NC Virtual Public School program, is that some schools have been providing many enrichment courses to students through Virtual High School, courses like Introduction to Vet Medicine, The Holocaust, and The History of Rock-N-Roll. They are now required to get all of their online courses from NCVPS, who does not yet offer these types of courses. There is s great deal of frustration around this, among secondary school distance learning folks. Edwards promises that they are working as fast as they can to add in the enrichment classes. They were mandated by the legislature to offer the core courses first — courses that help kids graduate. Edwards had said earlier that students could take only specific modules within a single online cours. So I asked about students taking modules, asking for a scenario of a problem that this might solve. Edwards said (paraphrased), Student takes the Algebra II EOC (End of Course) test and fails. But in reviewing their test, they simply bombed polynomials. That student can then take only the polynomials module of the online course, and then complete the course, rather than sitting in Algebra II again. home run! Bingo! Much of the rest of the morning was shop talk. a lot of acronyms that I know most of the attendees work with every day, but they meant nothing to me. One idea that occurs to me, however, especially as I hear several times that they are mandated to offer services of high need is that they are working to the left of the long tail. They are working to solve common needs, and in a world of scarcity, this makes perfect sense. But how do you move into the long tail, to offering courses and services that are desired by only 1000 students across the state, or 100, or 10. It seems that it would be technically possible to create an open tool with which anyone could create and populate a course one some topic of personal interest, expertise, or experience. There would be standards of quality and probably a streamlined and timely approval procedure. But then the personal who creates the course might be payed for maintaining and facilitating it per enrollment. No, it doesn’t need to be plugged in to be an appropriate learning technology. I saw this, first hand, several months ago when I visited and worked with educators in New Zealand. I’ve already talked about the innovation that I saw in their vendor exhibit hall, but one that impressed me, perhaps, more than any other was FlikStik Fun-Abacus. The invention of educator, Dr. Des Rainey, the tool’s richness is in it’s simplicity. It consists of a foot long rod, a handle on one end. On the rod can be clipped colored balls, expended out from rigid posts. 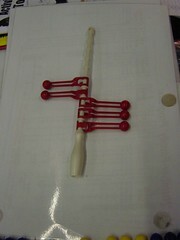 Once assembled, the user (4, 5, 6 year old) can hold the rod, and spin the balls around in both directions. Then stopping the spin, leaves some of the balls to the right and some to the left — and here is the magic. Thinking about and talking about how the balls lie after a spin can only be done by thinking and talking in math. New York teacher and blogger, John D. Howell, who seems to be about my age (favorite music: Carlos Santana, Crosby Stills Nash, & The Grateful Dead) has started a list of suggested summer reading. Pick this mime meme up. It’s tradition! Giroux, Jeremy. “Mind Reading – March 2007.” Jay GI’s Photostream. 3 Apr 2007. 25 May 2007 <http://flickr.com/photos/jayswww/445116523/>. I believe that the Flat World, Flat Web, Flat Schools keynote was a hit yesterday, in that it connected with issues of distance learning professionals. I was concerned, as I am with every address, but especially with audiences whose work is somewhat different from my experiences. But we’re all in the process of re-inventing ourselves and what we do as educators, and distance learning folks are still joyously inventing their work and tools for the very first time. We all need new, large, and slightly off-kilter ideas to keep us thinking. The one miss is the fact that many in the audience are involved in teaching students who are not millennials, who are old, even as old as me. The statement that many of our students are more literate than we are, from the perspective of their information landscape, does not fit. However, it is critical to understand that even when we are teaching adults, helping them to develop their teaching skills or retooling for a new job, we are preparing them for a future that will be dominated by people who have grown up with information experiences that are difficult for must of us (over 35) to imagine. We have to understand it.